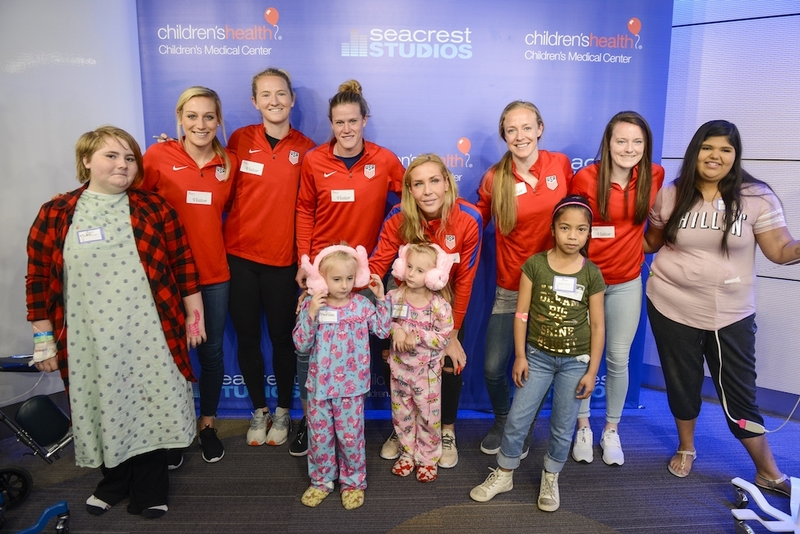 Written By: Paula Cuadrado Video By: Chance Harris ---- Members of the U.S. Women’s National Soccer Team stopped by Seacrest Studios to hang out and inspire some young patients at Children’s Medical Center in Dallas. The team was in town for a match and made time in between training to give back and visit a packed studio of fans. Natalie, 10, told the team soccer is her favorite sport. When she said she also liked to dance, the team asked if she could show them some moves. Natalie bounced out of her chair, the DJ cued up “Juju On That Beat,” and Natalie showed Team USA how it’s done! It was an extra special day for Kailyn, who is six, to be able to leave her hospital room for a little while to meet the players and take some pictures with them. The team shared about training and dealing with injuries as well as how young they were when they started playing soccer and the honor of being part of Team USA. Thank you Women’s National Team for visiting Seacrest Studios!